IT’S TIME TO LIVE THE ULTIMATE PC GAMING EXPERIENCE! – Whether you are aiming, targeting, slashing or attacking, a professional computer gaming mouse is your best weapon! Discover the most responsive and comfortable TeckNet Pro Gaming Mouse! The ideal pc accessory that will skyrocket your performance! COMFORT & PRECISION AT YOUR FINGERTIPS! 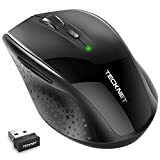 – The TeckNet Pro Computer Gaming Mouse is an essential computer accessory for die-hard gamers! You will be amazed by the unmatched comfort, lethal accuracy and killer precision of our durable, desktop and laptop pro gaming mouse! MIGHTY 7000DPI OPTICAL SENSOR! 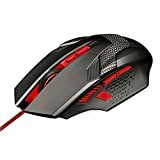 – Are you tired of struggling with flimsy and frustrating computer gaming mice? Our advanced, heavy-duty 7000DPI optical sensor is here to make your life easier and your gaming performance legendary! Plus, you can easily adjust the 8 DPI settings (1000/1500/2000/3000/4000/5000/6000/7000) to match your pc gaming needs! ULTRA-SLEEK ERGONOMIC DESIGN! – Not only will this programmable desktop and laptop mouse provide unparalleled comfort and unique grip, it will also look extremely sleek and stylish on your desk! 7 Customisable Lighting , you can rest assured that your pc gaming mouse will impress everyone! THE CHOICE OF DIE-HARD GAMERS! – Our premium gaming mouse is the ultimate solution for any type of game, be it FPS or MMORPG! Its 8 responsive and customizable buttons as well as its ultra-ergonomic design will offer you that right balance of accuracy and precision you so much desire! Compatible with Win Vista/7/8/10. Here’s How To Turbo-Charge Your PC Gaming Performance Easily! Are you tired of frustrating, unresponsive gaming mice that freeze during the most crucial battle and leave you at the mercy of your enemies? Are you looking for that ultimate pc gaming mouse that will offer your unparalleled comfort, deadly precision and killer accuracy? Presenting The TeckNet Premium Professional PC & Laptop Gaming Mouse! The ultimate gaming accessory for every die-hard gamer who wants to enjoy maximum performance and sleek, ergonomic grip! Why spend another day with a low quality, flimsy mouse when you can add a nuclear weapon to your pc gaming arsenal? Legendary 7000DPI Optical Sensor & 8 Mighty Programmable Buttons For Top-Notch Gaming! Our durable and ergonomic, desktop and laptop gaming mouse comes with an integrated, powerful 7000DPI optical sensor for maximum precision and accuracy! Plus, the TeckNet pro computer gaming mouse features 8 handy, fully customizable buttons for unmatched performance! Unleash Your Inner PC Gaming Beast In Comfort And Style! We have designed our advanced computer gaming mouse to exceed even your highest expectations! Its ergonomic and comfortable, nonslip shape will offer smooth gliding and the added weight will boost your in-game precision and accuracy! Dare To Compare! – Why Our Gaming Mouse Is The Ultimate Choice! 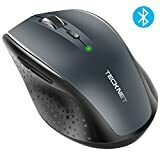 We, at TeckNet have designed a gaming mouse that offers smooth and responsive tracking, a snappy optical sensor and unparalleled ergonomic handle! Why settle for a low quality, costly gaming mouse, when you can own the ultimate gamer’s mouse? Don’t Hesitate! Indulge Yourself! Click Add To Cart Now While Supplies Last!